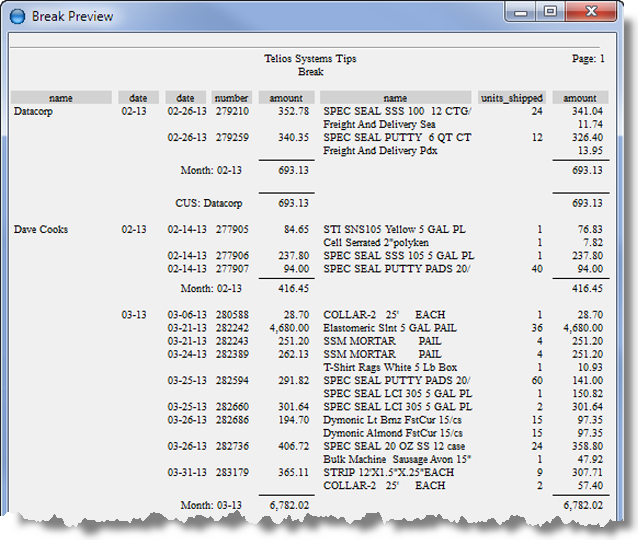 date repeat on shipment number — We added a separate date column to show the actual date for each shipment. number norepeat — Since we’re now printing all the line items for each shipment, we put a norepeat on the (shipment) number column. amount repeat on number — For the (shipment) amount field, we want the amount to print only once (when the shipment number changes). ship_items name size “30” — this prints the inventory part number or other code name. The size sets the maximum column width. For this field, the dictionary value for the width is 60 characters, so we’re trimming it down. units_shipped suppress — the suppress word will leave the column blank if the value is zero. amount total — this is the shipping line item amount field. The total word would normally print a total at the end of the report. But, with break fields, the total will print as a sub-total for each break level and a grand total at the end of the report.